Like most of the nerdoverse, I made my way in to the Watchmen with feelings comprised of equal parts anticipation and trepidation. While the prospect of seeing an adaptation of one of the seminal works of the comic book genre was thrilling, my cynical (or realistic?) side made me acutely aware that it could very well be a train wreck. Thankfully, I found the film's themes remarkably faithful to the book, and its deviations from the source understandable and acceptable (albeit somewhat disappointing). As others would agree, the movie seems to be both a worthy ode to the book, as well as a commercial hit. Of course, my mind tends to wander to video games, so I began thinking about why video game to movie translations are so dreadful, while comic book films often succeed. I have always thought of video games and comics as spiritual cousins in terms of their appeal and their fight for cultural legitimacy, and so the dearth of respectable video game movies strikes me as odd. After some thinking, I came up with five reasons comic book films succeed, and what video game adaptations could learn from them. Before I proceed, a word of caution: do not read into this too deeply. I do not mean to suggest that video games need to be made in to films, need to be more like films, or are inferior to either comics or film. Look at it as a light hearted thought exercise and a longing to expose a broader non-gamer audience to the works we all enjoy. This may seem obvious, but the importance of talented actors cannot be overstated. Even when he finds himself in a bad film, RobertDowney Jr. can carry the sucker. Thankfully, Ironman was a fun time, but largely because Downey was able to create a unique, believable character to hook people in to a relatively unknown character and a story. If relatively niche video game franchises are to be made into movies, they need aDowney-esque actor to carry them. Sorry Freddy Prinze Jr., Wing Commander was too heavy for you to carry. Seriously, no more Uwe Boll. Here is where things start getting painful. Regardless of how much everyone liked the Tales of the Black Freighter and New York's death by mutant sea food, it is clear why these things were cut from the silver screen's Watchmen. The need to create a cogent story that appeals to those less knowledgeable while retaining a reasonable run time means a certain loss of content, and perhaps even sophistication. The best thing about Christopher Nolan's Batman movies are their faithfulness to spirit of their source material. While he has had some mood swings, Batman is essentially a dark, brooding character who protects a city that serves as a metaphor for his damaged psyche. Nolan understood this, and thus his deviations from previous Batman stories were forgiven because of his adherence to themes respected by fans and understood by newcomers. Video game movies seem to have difficulty sticking to the spirit of the source material. Take the Super Mario Bros. movie: the film tries to place the characters and settings of Mario in a real-world context. Bad sci-fi explanations of the Mushroom Kingodom and cheesy special effects leave fans disappointed and newcomers baffled. The problem here is not that someone tried to make a Mario movie; they tried to make the wrong one. Why not embrace the psychedelic acid trip that is Mario's world and make it an animated film that does not have to justify the existence ofKoopas or fire flowers? Bowser already has an image problem, no need to complicate things with Dennis Hopper. Some comic books lend themselves especially well to film adaptations and require relatively little adaptation. X-Men is a prime example because every character has distinct, recognizable powers that complement their characterization. Wolverine fights like a beast and has metal claws; he is the surly outsider. Cyclops can sets his sights on evildoers and blasts them with pure energy; he is the morally upstanding captain. Professor X has nearly limitless psychic and intellectual abilities; he is the cerebral, all-knowing mentor. When making a video game, people must be honest about how much source material is included in the game, rather than bestowed by the player. A protagonist like Link is beloved because of a combination of nostalgia and projection: his long history of silence has allowed players to concoct their personal back-stories and any film adaptation would do nothing but disappoint them. Final Fantasy is a series with complex characters, but the scope of the stories and the emotional arcs take dozens of hours and hundreds of lines of dialogue to explicate. Distilling the experienced of Final Fantasy into a two hour ride is contrary to what the series stands for, and thus it should never be filmed. On the other end of the spectrum, Gears of War seems like a logical choice for a solid action movie (as others have noticed). Incredibly buff space marines with attitude and badittude; the screenplay almost writes itself! Again, I do not make theses suggestions to imply that film translations are necessary for video games to assert some sort of cultural credibility. I think it is only natural for folks to want to see respectful re-interpretations of their favorite art, and for capitalism to incline towards squeezing every last cent out of every cultural artifact it can get its hands on. I only suggest these two impulses need not be mutually exclusive. 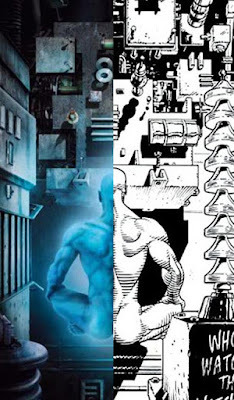 There was some talk about the value of Watchmen as an Adaptation in other blogs too. I enjoyed the movie and agree with you on the points you've mentioned. However, a fellow blogger pointed out Starship Troopers as a superior way to make an adaptation - one that specifically doesn't follow an original but one that changes the material to work out interpretations which the original wouldn't offer. A adaptation that stands on its own as a unique work with its own statement. I believe the Nolan Batmans (and in some ways the Burton Batmans) fit into this category, but neither 300 nor Watchmen does. I like the point Krystian is making-- I don't think you need to stick to the source material in the sense of following the story. It forces the audience to draw comparisons between their experience of the story as told through the game and their experience of the story as told through the movie. They are both very different forms of storytelling, and in a way, they can't really tell the same kind of stories. If a movie had the main character fight off hordes of demons for a full hour just to obtain a blue key, followed by another hour of demon fighting just to open a blue door... well, I wouldn't want to drop my cash at the box office to see it. On the flip side, when games have huge cut scenes that don't involve the player, they start to get frustrating because you want back in on the action regardless of how good the story is (I'm looking at you Xenosaga). Videogames are unique because the story depends on your skill as the player to advance, and that little distinction drastically changes the type of storytelling that can be done. Take the Don Bluth games of the 80's (Dragon's Lair, Space Ace, etc.) for example. These games were cool back then because when every other game had blocky, pixelated characters for you to control, Don Bluth's games were cinematic cartoon experiences. I always loved these games because of how much they were like a movie, even though I found the controls to simplistic and annoying. I later bought Space Ace for DVD and played through about half of the game. It was nostalgic fun, but I couldn't stand the game play after awhile, so I just decided I would use a feature the game had to let you watch the whole thing without having to actually play the game. Surprisingly, I was even more bored with it than I was when playing it. I thought I had loved the game because of it's story and visuals, but when you remove the gameplay aspect entirely, even though it is completely terrible gameplay, the movie and story don't hold up. I realized then that videogames and movies are very different mediums. The way the play control and storyline intertwine in a videogame is deeply important to your enjoyment of it. It is the fact that you play an active role in the story that makes it great. The fact that our skill has an impact on the outcome allows us to better graft our personality onto the main character and immerse ourselves in the fantasy world of the game. I think this is also why role playing games with silent protagonists are so well loved (Ocarina of time, Chrono Trigger, Nocturne) despite the fact that everybody complains about silent protagonists. I think a videogame movie can succeed by carrying on the characters and feel of the videogame, but not by pretending that they can retell the story in a better way. As gamer's we are often sad when the story ends to one of our most cherished games, because even though we may be celebrating our victory we have to mourn that the fantasy has come to a conclusion and the characters we have grown to love are effectively dead (unless you are lucky enough to get a decent sequel). This is why characters like Mario, Link, and Samus Aaron are all still around today and why (20 something years later) gamers are still upset over the fact that nobody has made a Kid Icarus sequel. We love these characters and we want them to live on in Neverending Story fashion. Movie makers can cash in on this by telling a story about a new chapter in the lives of these beloved characters that we haven't heard before. And as long as that story can really convince us that those ARE our characters and that their fantasy world lives on where we can return to visit them, then we will probably love the movie. But if a movie just tries to retell the story of the game, then meh... I could have replayed the game if I wanted that. I can't speak to Watchmen as I've yet to see it, but when it comes to Christopher Nolan's Batman films I think a major element in why they are so good is that above everything else they are simply good films. Stripped of the Batman context I think both films, and The Dark Knight especially, could stand on their own. It seems when making Video Game adaptations the assumption is that the film can live on the power of the Video Game name alone. I got rather excited when I saw some of the work Weta were doing for the Halo film (Specifically those live action combat trailers for Halo 3) because they seemed to be aiming for making a well produced and well directed Sci-Fi movie first and Halo franchise product second. I'm not sure I agree with JT that films can't retell the stories of video games, but I do think that if they are going to attempt to do so they need to tell those stories in a fashion more fitting the nature of video games. If we can accept some self-promotion I wrote a while ago about how I'd envision a System Shock 2 movie being handled; which seems oddly pertinent now that a BioShock movie is in the works. Good point on the distinction between Batman and Watchmen. I think it's fine to offer a different interpretation and even to go so far as playing with the "canonical" events of a story as long as the tone is faithful to the original. For example, the Rachel character in Batman plays fast and loose with the Batman mythos, but the overall tone of the movie (dark, brooding, Batman's ideology, etc.) is faithful to the source. Totally in agreement with you about how difficult it is for movies to capture the essence of gameplay. One of the most satisfying things about games (obviously) is being an active participant, so they by definition lose something in a big-screen adaptation. Well, this thread is starting to seem like a love-fest: I'm right with you about why the Batman movies are enjoyable.